Construction is slated to begin on the roundabout at Route 52, Unionville-Lenape Road and Wawaset Road. The $2.15 million project is expected to be completed by Sept., 2014. POCOPSON — Delayed in part by utilities issues, construction work on the roundabout at Route 52 and Unionville-Lenape Road is expected to start Jan. 20, Pennsylvania Department of Transportation (PennDOT) announced Monday. The $2.1 million project to improve travel and safety at the intersection of Route 52, Wawaset Road and Lenape-Unionville Road is expected to take nine months to complete. PennDOT officials stressed that this project should not be confused with New Jersey-style traffic circles, and would be similar, although of larger diameter, than the roundabout on Route 82 and Doe Run in neighboring East Marlborough. 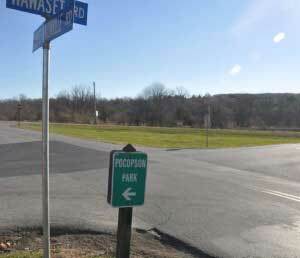 “The roundabout to be built in Pocopson Township is much smaller than the traffic circles of earlier years and will move traffic safely and efficiently through this triangular intersection by reducing travel speeds, reducing conflict points and making it easy for drivers to choose their route,” PennDOT District Executive Lester C. Toaso said. PennDOT officials say that roundabouts offer improved safety over other forms of intersections and typically carry about 30% more vehicles than similarly sized intersections during peak travel times. Roundabouts also improve pedestrian safety, they say, by allowing pedestrians to cross a single lane of slow, one-way traffic at a time. This roundabout, which was designed by the township, will be the first built by PennDOT in southeastern Pennsylvania. There are currently five other roundabouts — including the East Marlborough site — in the Philadelphia region that were constructed by a municipality or private developers. PennDOT’s contractor will build the roundabout in three phases over the next nine months. In the first two phases, crews will excavate, realign and widen the approaching roadways. The single-lane roundabout will be constructed during phase three. Crews will also build a center island with landscaping, and install new storm water drainage, pavement markings, lighting and signs. During phase one, which will run from Jan. 20 to September 2014, Wawaset Road will be closed and detoured between Corrine Road and Lenape-Unionville Road. Motorists will be detoured over Corrine Road, Locust Grove Road and Lenape Unionville Road. Motorists are advised to allow extra time when traveling through the area. Road-Con Inc. of West Chester is the general contractor on the $2,151,848.35 project, which is fully financed with federal funds. The township performed and financed the engineering design and right-of-way acquisition phases of the project, in part with grants from various governmental sources.